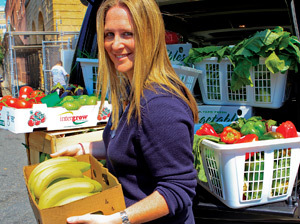 Ashley Stanley, founder and executive director of Lovin’ Spoonfuls, Inc.
“Is this for us?” asked a homeless man in near disbelief as he helped to unload fresh produce and meat from Ashley Stanley’s car. Indeed, he and others dined on the abundant greens and fruit that night at the Boston Rescue Mission. Wellesley attorney Eleanor Uddo, who worked with City Year’s three founders to form what became a national success story, now provides similar legal service to Lovin’ Spoonfuls. She helped the organization become a 501(c)3 nonprofit with a strategic business plan. “The clarity of message, commitment, and boundless energy exhibited by that City Year group of three from its inception is exactly what I see in Ashley,” said Uddo. Stanley, 33, grew up in the Wellesley home where her parents still live. She attended Upham School and Dana Hall and says she was the first woman recruited out of Rivers to play Division I soccer on a scholarship, at the University of Rhode Island. When she “blew out” her knees, she dropped out, completing her degree later online. “After college, I worked for two years at Ralph Lauren in New York, working my way up from the bottom,” she said. “It was a sharp contrast from being an athlete. I was sweeping floors, getting to know the product. I loved the old school modality of customer service that is prevalent at that company, and tried to sink my teeth into every aspect.” She helped open their stores at Copley Place in Boston and Soho in New York before leaving the job. Stanley said she has never known what it is to be hungry, but around the holidays last year something clicked for her during lunch at Captain Marden’s. “Mom and I were saying how news about the recession and hunger was everywhere, and we weren’t finishing our lunch. It got me thinking. I went home, got on the computer and started Googling what happens to wasted food, basic questions about restaurants and supermarkets. Homelessness and hunger came up, and things like City Harvest, which 25 years ago pioneered the concept of food rescue in New York; Philabundance in Philadelphia; Foodrunners in San Francisco; and a blog called wastedfood.com, which in a strange coincidence, is written by Jonathan Bloom from Wellesley and we went to Hebrew School together.” A woman at City Harvest walked her through the fundamentals and how that organization now collects and delivers over 26 million pounds of food a year. 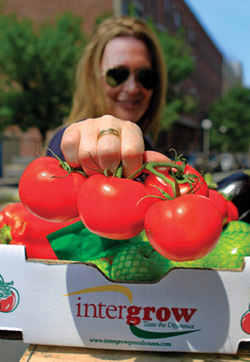 Surprisingly, when she called about 15 Boston and MetroWest food markets, she was told that no one was picking up their excess perishables when they came off the shelves. This turned out to be the norm despite former President Clinton’s signing into law in 1996 the Emerson Good Samaritan Food Donation Act, which protects food donors who meet safe-food guidelines. First to share its edible wealth was Trader Joe’s in Brookline where she shops. The store manager agreed to participate on the spot. Not knowing what to expect, Stanley arrived the next morning to find 600 pounds of food waiting. “Until you see what that looks like, crates and crates full, you have no idea,” she said. Sometimes she said it’s like driving a mobile farmers market. One day, she got 60 eggplants. The crew consists of Stanley and her cousin and principal driver, Ben Delfiner, 28, using their own cars, aided occasionally by volunteers. Five or six days a week, by 7:00 am they begin at Whole Foods Market in Brighton, Trader Joe’s or Japonaise Bakery in Brookline, Panera Bread, City Feed & Supply, and other stores, and deliver to the Pine Street Inn; Boston Rescue Mission; Respond, Inc., a domestic violence shelter; and Haley House, serving the homeless or underemployed. By 11:00 am, they’re done. Afternoons, she contacts more potential donors. They also bring pet food to animal shelters. Within months, Delfiner and Stanley transported an average of 1,000 to 1,500 pounds of perishables every week. A good day was 800 pounds. During Boston’s “boil water” emergency, she contacted Staples, Home Depot, and Nine East Wine Emporium. Together they donated 1,500 pounds of bottled water for Pine Street and the Boston Rescue Mission. In May, she had big news. “Captain Marden’s is donating a refrigerated truck to Lovin’ Spoonfuls. Kim Marden said they’re fixing it up for our use. Soon we’ll be able to move as much food in one day as we now do in a week, work with more vendors, and broaden our distance range.” It means they can accept more donated meats and other protein-rich foods especially valuable to social service programs unable to afford the expense. Both Stanley and Delfiner are certified by the same ServSafe® regulations that govern restaurants regarding refrigeration, storage, and use. She’s not shy about asking for help. While dining at Legal C-Bar, she talked to the manager who volunteered his staff to help haul for Lovin’ Spoonfuls. She uses social media—Twitter and a Facebook fan page—to thank them, post the organization’s message, “Hunger alleviation = team sport,” and news. WGBH radio’s Callie Crossley interviewed Stanley and State Representative Paul McMurtry (D-Dedham) about a bill he recently introduced that would allow restaurants and cafeterias to donate cooked leftovers to pantries and homeless shelters, and get tax benefits, without fear of lawsuits if someone gets sick from it. Pine Street Inn Acquisition and Distribution Manager Jack Nolan said what Lovin’ Spoonfuls does is significant. “We serve about 2,100 meals a day between our emergency shelter and a transitional program. We never really got fresh produce donated before. Ashley and Lovin’ Spoonfuls have better resources to pick up at smaller places. They might bring us ten pounds of onions. We use 100 pounds a day but that means we have to buy less. And because our vehicles are on the road delivering meals, we only have small windows of time to pick up donations. We rely on volunteers and get donations from food drives at schools and churches, usually once a month, but Ashley’s here almost every day, typically delivering 75 to 100 pounds of food. Her first delivery was mushrooms and bananas and apples, fruits we use every day. It was great. When they brought cinnamon raisin bread, we made bread pudding for a special dessert.” And, he adds, Ashley gets the word out. So do the prominent chefs, caterers, a TV food personality, and local foodies on her Advisory Board. Andrew Zimmern, the Travel Channel’s Bizarre Foods maven interviewed Ashley Stanley for his Facebook blog. Others include chefs and restauranteurs Ming Tsai of Blue Ginger; Christopher Myers of Myers+Chang, Radius, and Via Matta; Jeremy Sewall of Lineage, Eastern Standard, and the Hotel Commonwealth kitchen; and members of the Aquitaine Group. Stanley said she has enough money to support herself for one year while getting the organization off the ground. 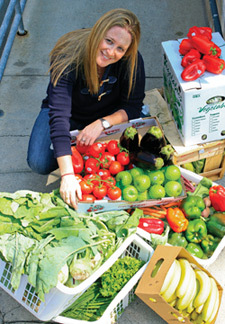 By then, she and Delfiner hope to have several trucks, a small staff, and the ability to impact the community tenfold.